I was interested to know, what’s the difference between Come and Come here? I’m guessing Come is what you’d use if you’d stopped to talk to someone, and then you were ready to move forward again, and Come Here is to come and touch you? Anyway, I think there is so much more a Guide Dog puppy can be taught than what is currently on the list. I’ve had two Guide Dogs from Guide Dogs UK, and a third which didn’t work out because the dog came with a number of problems, not all of which could be ironed out. I now train my own dogs, and have taught some useful extras as well as the normal guiding. Firstly, bringing me named items, such as keys, phone, wallet, white stick etc. This is great for if I’ve put them down and forgotten where. You start off with something soft like a glove and then move on to the harder and less durable objects. Also picking items up that I drop such as bus pass, train tickets etc, and finding very small items that I drop by having the dog put it’s nose on them and wait till I’ve located it. So if I dropped say a pound coin, I could ask the dog to Show Me and take hold of its collar. Then it would take me to the coin and drop its nose down without picking it up, and keep still till I’d located it and picked it up off the floor. 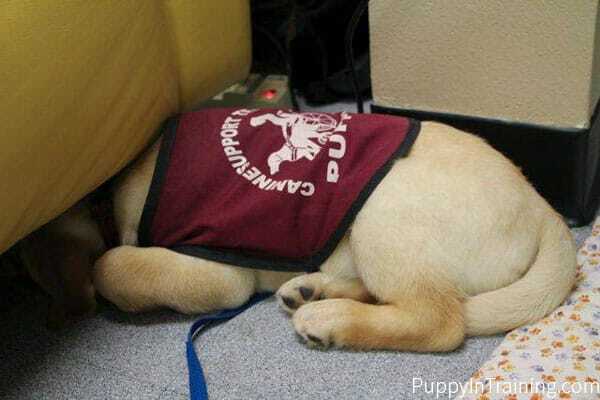 I do think for def that Guide Dog Puppies ought to be taught as a matter of course to retrieve to hand. Because if they don’t, how can their blind owner play with them properly. Your service dog sounds really interesting. 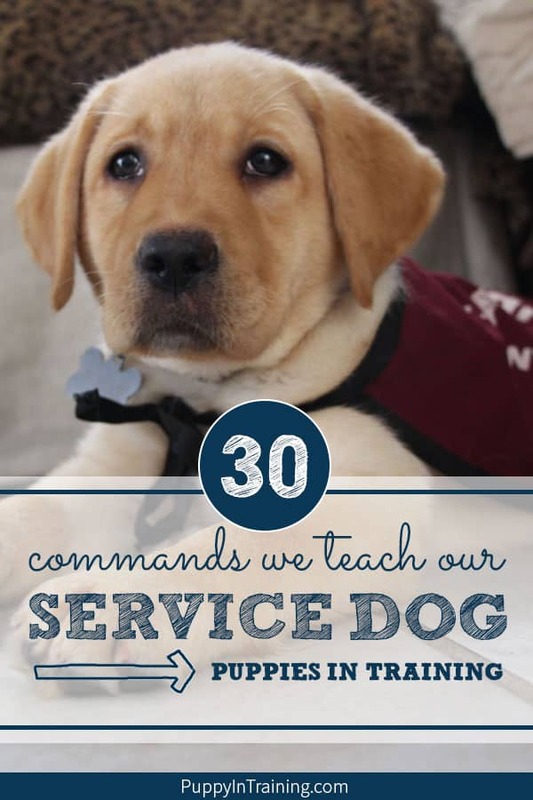 It’s cool to know what a service dog can learn. I think it’s amazing that they can learn commands like “go around” and “careful”. Why are dogs so amazing? My brother may need a service dog, so I’ll tell him this. I would have thought “Drop” or “Drop It” would be in the original 9 or 30 training words. 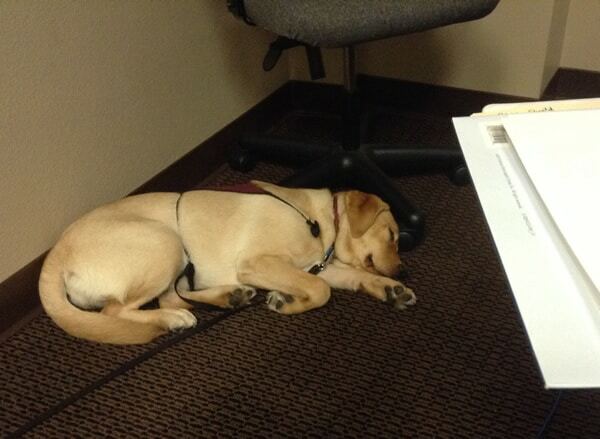 Seems important if the service/guide dog had something inappropriate in their mouth (socks, meds, etc.). How long does it take to train the dogs with each command? Do you do a new command each week or is that too quick? I would have thought that the guide dog list of commands would be longer than the service dog commands since they are working with someone without sight. So interesting! Thanks Colby! Yeah, “Drop” can be pretty important in a lot of situations. The amount of time it takes to teach a dog will vary based on the individual dog and the difficulty of the command. One thing we learned is that some dogs will physically have more difficulty doing a command. For instance, we were teaching Archer to “Sit Pretty”, but because of his physical attributes he had difficulty getting into the position and holding it. However, I’ve seen other breeds have no problem sitting pretty and holding it for 10 seconds or longer. We running into the same problem with Stetson. He may know commands, but now that he’s almost 12 years old he has some difficulty performing commands because it is physically difficult for him with his arthritis. Nowadays we don’t expect Stetson to do puppy pushups (quick sits and downs in succession) or anything else that is stressful on his body. it’s amazing that they can learn commands like “go around” and “careful”Do you do a new command each week or is that too quick? I highly recommend a trainer. I would have thought that the guide dog list of commands would be longer than the service dog commands since they are working with someone without sight. So interesting! Thanks Colby! I have a little dog that looks like a min pin but i was told buy the lady that gave her to me that she’s chiwawa mix. Anyway she is high strung, she sits, sits pretty, dances on command, kisses, waits as long as there is no distractions, she does not get ” down” she just refuses, she will come but only in the house not outside. There is other things we are trying to work on but is difficult, i have osteoporosis in my knees& hips so it’s hard to do alot with her. Amora is 8 months old and i want to train her before she to old to get set in her own ways. Any suggestions? I love her to death and don’t want to replace her. Oh yeah she does give hugs too.